Rich Tool Systems has everything you need to finish any project you start. Our heavy-duty PSA sanding discs are great for tough jobs using your DA sander. They come in several grains and have a stick-on or hook-and-loop back. These sanding discs are made for rough sanding and shaping body fillers and are also good for light metalworking. 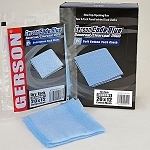 These heavy-duty sanding discs are made with a strong paper backing also known as Mud Hog Paper or Bondo Busting Paper. 6-inch and 8-inch diameters are available. Stick-on discs are available in packs of 50 and Hook-It discs in packs of 25. At Rich Tool Systems, we want to make sure you have all the best tools for all the toughest jobs, start to finish.